Singing the cake at my nephew Noah’s 7th bday. Noah’s multi-talented mother and my sister-in-law, Marla Gomes Casseres, baked and decorated an Awesome tennis racket cake to match the theme. In Papiamentu we say, “ban kanta bolo!” (let’s sing the birthday cake). Our focus is singularly on the cake and the birthday treats… much less on the birthday person. 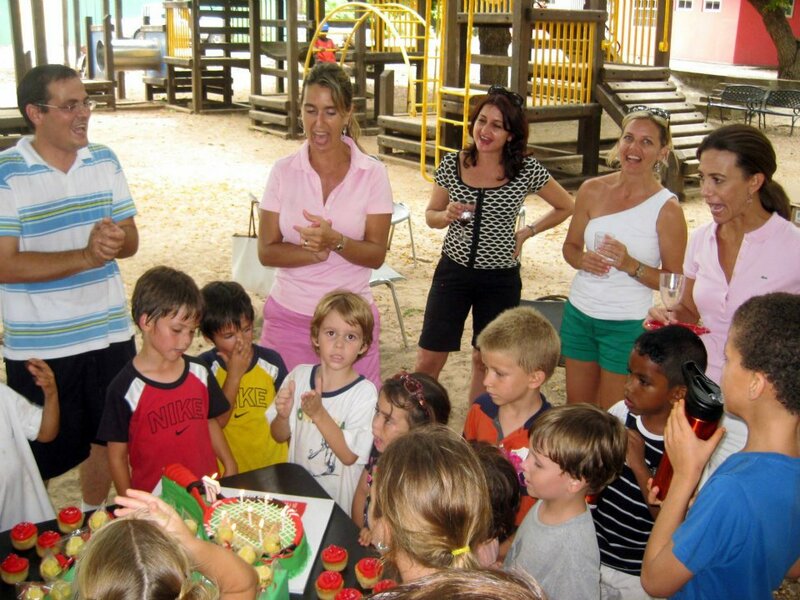 “Singing the birthday cake” takes a long time, because yu’i Kòrsou are very inclusive, we don’t want to leave a language out inadvertently and tend to throw them all in the song mix: Papiamentu, Dutch, Spanish, English, sometimes Hebrew or Portuguese. (I’m sure I’m missing some! Please send me your favorite birthday song?) The lengthy singing does, however, delay cake gratification…… Papiamentu: Salú ku bolo nos ke (We want drink/cheers/good health* and cake) Salú ku bolo nos ke (2x) (We want drink/cheers/good health* and cake) Salú ku bolo, salú ku bolo Salú ku bolo nos ke. Si no tin nos ta bai (riba kabai) (2x) (If you can’t [offer], we’ll leave on a horse [we’ll bolt]) Si no tin, si no tin, Si no tin nos ta bai (riba kabai) Pasombra tin nos ta keda (riba tera) (2x) (If you can, we’ll stay [on the ground]) Pasombra tin, pasombra tin, Pasombra tin nos ta keda riba tera. * Depends on who you ask. I subscribe to the “good health” translation. Dutch: Lang zal die leven (Let him / her live long) Lang zal [hij / zij] leven, Lang zal [hij / zij] leven, Lang zal [hij / zij] leven in de gloria In de glo-ri-a, in de glo-ri-a Hiep-hiep-hiep hoera! Hiep-hiep-hiep hoera! Let him live long, Let him live long, Let him live long ‘in glory,’ in glory, in glory hip-hip hurrah! hip-hip hurrah! Er is er een jarig hoera-hoera Dat kun je wel zien dat is hij (point finger) Wij vinden het allen zo prettig ja-ja, En daarom zingen wij blij: Hij leve lang hoera-hoera, Hij leve la-ang hoera. It’s someone’s birthday today hurrah-hurrah, It’s easy to see that it’s him. All of us think it’s really nice, And that’s why we happily sing: Let him live long hurrah-hurrah, Let him live long hurrah. Spanish: Cumpleaños feliz te deseamos a ti cumpleaños (name) cumpleaños feliz Portuguese: Parabéns a você, nesta data querida, muita felicidade, muitos anos de vida Parabéns a você nesta data querida muita felicidade, muitos anos de vida! Hebrew: Yom Huledet Sameach Yom Huledet Sameach Yom Huledet Sameach Yom Huledet Sameach English: Happy birthday to you, Happy birthday to you, Happy birthday, happy birthday, Happy birthday to you. Happy birthday, Happy birthday, Birthday, birthday, Happy birthday. Ban ban pasa un rondu no por keda afo. Paso kende nos ke tuma?